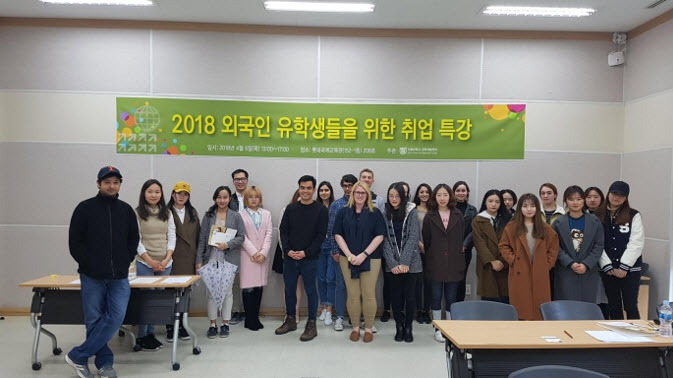 On April 5, the SNU Career Development Center hosted “Working in Korea,” a coaching session for SNU international students hoping to find work in Korea after their graduation. More than 40 international students attended the session, which was organized by Kim In Kyung, an international talent researcher at the Center. In the lecture series, Chief Operating Officer of SuperTrack (the company that provides Amazon Web Services in Korea), Kim Jongseob explained how to write resumes that meet the expectations of Korean companies. Chung Eun Joo, Director of Korea Trade-Investment Promotion Agency (KOTRA), gave the next lecture further explaining procedures for preparing applications to Korean companies. Woo Junghoon, an SNU alumnus currently working as a manager data scientist at Klynveld Peat Marwick Goerdeler (KPMG), an international professional services company, also gave a lecture in which he shared his application process and working experiences with the students. A question and answer session followed his lecture.